This week, I’m excited to share Calendar : Cooking’s first ever guest post. First, a quick bit about our guest: She was born in England and raised in Tucson, Arizona. She spent her childhood trying to hear the difference between “tom-ah-to” and “tom-A-to”. She blogs at www.thoughtsforasunshineymorning.blogspot.com. And, right on time for summer, here she is: ladies and gents: the multi-talented Laura Owen, telling us just how she got over lettuce. Hope you enjoy, and I’ll be back next Monday with more recipes for the week. I’ve always been a salad lover who is relatively indifferent to lettuce. At the end of salad, some lettuce always straggles on my plate after I’ve finished eating all the delicious fruits, nuts, veggies, etc. that I basically considered the salad a vehicle for. I’m not even that into dressing, which I use sparingly: it’s the smorgasboard of toppings, the chance to indulge in new and different fruit/veggie/protein combinations, that makes me a salad person. I discovered the following salad recipe on Hello Giggles, from a vegan-and-gluten-free food blogger, Laura Friendly (no relation). It blew my mind because: Cucumbers! They can serve as a salad base instead of lettuce! To which you might reply, oh, Laura, what about Greek salad? How have you never figured out that cucumber can be a base? 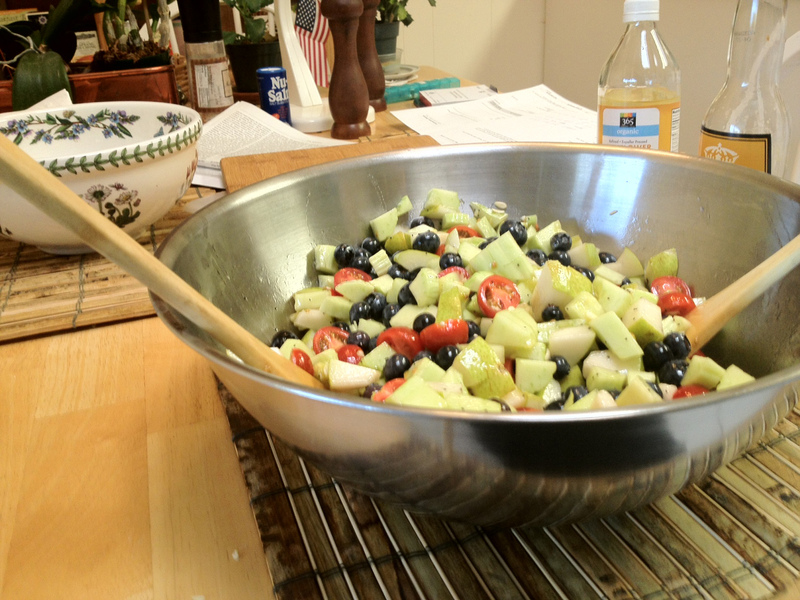 But: Greek salad always struck me as a little same-y; I get bored with all those cucumbers. You see this here recipe is for a FRUIT salad. 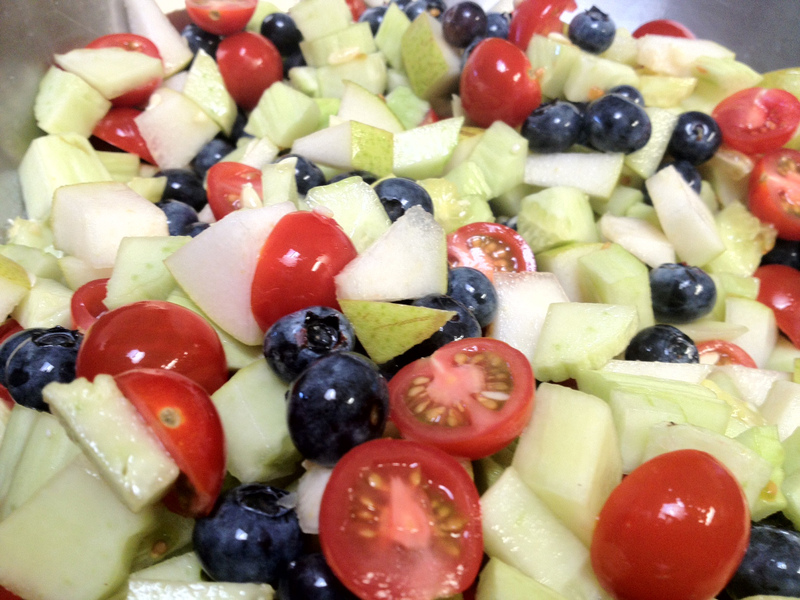 A savory AND a sweet fruit salad. Which is an intriguing idea. Why do pinaeapples and melons have the monopoly on fruit salads? I’ve eaten enough boring fruit salad spreads at parties to be sick of underripe canatalope mixed with honeydew forever. Tomatoes are a fruit, as we all know from elementary school. Why can’t tomatoes be a fruit salad? Alongside blueberries? Why can’t we live a little? 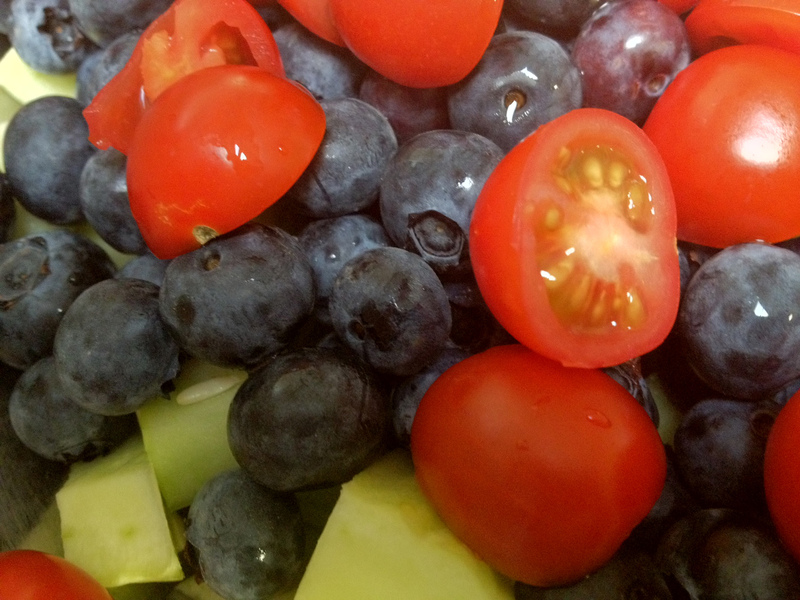 It shouldn’t work, (tomatoes and blueberries together seems fundamentally wrong, somehow), but it does. And the texture and flavor combination—soft and sweet and sharp and crunchy—oh, it is good. This time ‘round, our CSA had Armenian cucumbers, so I used them. 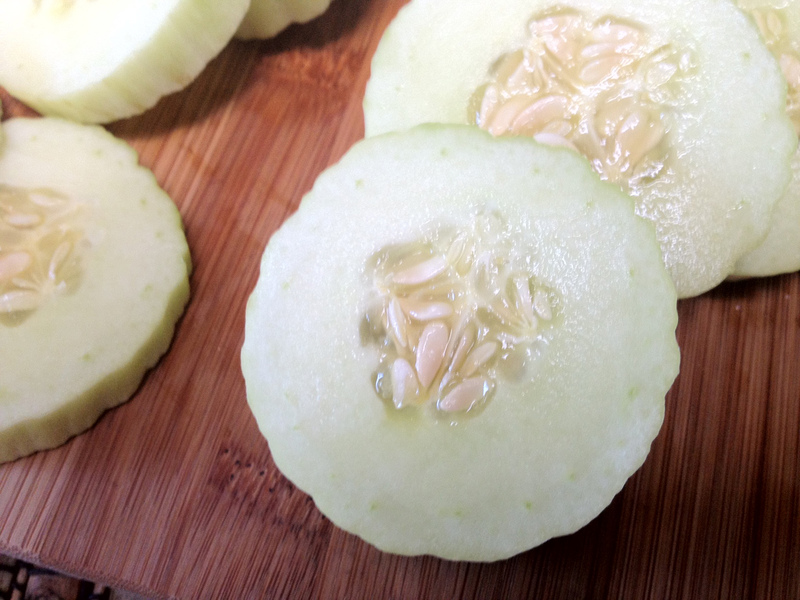 Armenian cucumbers have a thin skin and are basically a lot more cucumber bang for your buck. Plus, they look awesomely weird. For what it’s worth, I tend to leave out the avocado topping when I make this recipe. Don’t get me wrong: avocados are proof that a beneficent force guided the shaping of the universe, that’s how delicious avocados are. But I didn’t find they added much to this salad. Maybe this is it: the original recipe calls for a light oil, and suggests avocado oil. 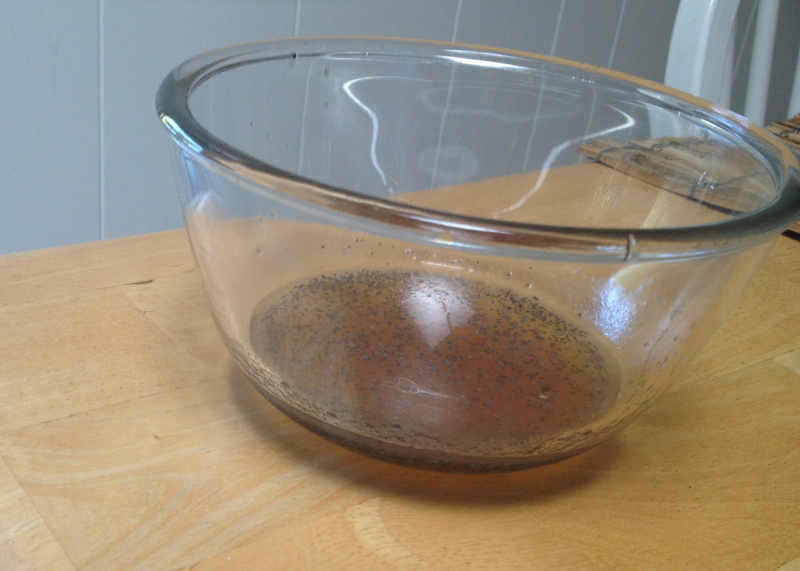 I’ve always used sunflower oil instead, because it’s what we have in the house, and it works well. Maybe the avocado adds a note to the avocado oil or something? Again, the sweet/savory combo really wins here. The agave nectar makes it just sweet enough, but the other ingredients stop the dressing from being cloying. My suggestion: the dressing can be quite oily, and the amount suggested here is MORE than enough. 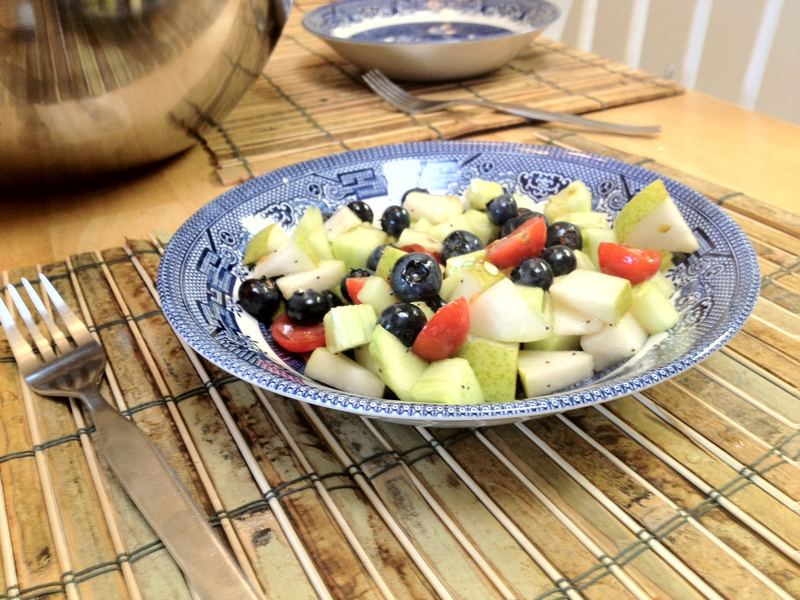 I tend to double the amount of fruit and keep the dressing recipe the same, which works well. And if you do double, you’ll have lots of salad: unlike lettuce-based salads, even if you dress it and keep it for a few days, the salad won’t get soggy and disgusting; it retains a crunch. It can make a whole meal (it’s very filling), or it’s nice and refreshing alongside something spicy. I would say “the salad is perfect for summertime,” and it is. But it’s really perfect for anytime. I want more of the salad right now, just typing this up. I always want to eat this salad. I exist in a constant state of wanting to eat this salad. Unlike other salads, there is never anything straggling on my plate. I eat it all up. You guys, this salad. This salad. This. Salad. Thissalad. Plus, it’s pretty to look at. Thanks, Laura! See you all next week, everyone! Also, here is a pic of the Armenian cucumber in its unchopped state! Yum! Salty + sweet = delicious.